I didn't see this game at all because I was at a BU game, where they lost 3-4 to the Vermont "What's a Catamount, anyway?" Catamounts. Solid game, good company, and a great time. "Everyone other team we play is afraid of Lucic. I wish he'd put up some better numbers." And here's another pieced-together video review Recap. Let's find out what happened, shall we? Looking at the scoresheet, it's pretty promising. The Bruins start playing some extended umbrella offense - Work it around behind your own net, pass it up to Savard, who'll put it on Kessel's stick at the other blueline, breakaway. Some joker on the panthers tries to turn it into a penalty shot, but Kessel whispers in Vokoun's ear, "I beat cancer, and I'm beating you, too." Vokoun looks like he saw a rat. GOAL. 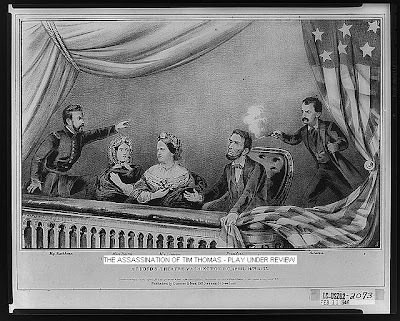 Then John Wilkes Booth comes into the zone, dinks one off the crossbar. Ref waves it off. Turns out later, that WAS a goal. Darn. 1-1. Halfway through the period, they get it behind Florida's net. Passes it along the boards, and Hunwick plays Chara for the day. SLAP. Bergeron tips it past Vokoun. 2-1. You have no idea because you just saw Gryba deliver a massive check and the Google Scores thing is only showing the last game and saturday's. Scoring ends in the first here, there's like 10 more minutes, and the Bruins had 14 Shots on Goal in the period. Honestly, do you really want to see a bunch of Vokoun Save highlights? It's just going to slow the page down. Ryder got another almost-goal at 1:33, it was a good setup. The mites will play a round and the Zamboni will resurface the ice while we're waiting. Across Town, the mites game at Agganis features Parkway. So many little kids playing hockey, but the real winner was the kid who, as they're all leaving the ice, is practicing his goal celebrations. Let's see, that's a couple of kneeling fist-pumps and then... A quality hip-checking yourself into the boards. Solid celebrations, way to go kid. Mite hockey at intermission is fun, and I bet the kids love it. Solid idea, Hockey. First, Krejci gets the breakaway and instead of streaking forward and maybe scoring, he sees the 3-on-1 opportunity and slows down just enough for Kobasew and Blake Wheeler to catch up. Krejci-Kobasew-Vokoun-Krejci. Goal. But the Bruins aren't done scoring just yet. Not when Michael Frolik is getting Double-Minors for high-sticking. Power play sets up. The Bruins goal-scoring stops at this point, so that means it's fightin' time. Jack Edwards is such a homer, and I wouldn't have it any other way. A whole bunch of moving the puck around and crap in the third, then with a little over 3 minutes left in the game, Ville "What kind of name is Ville? Oh wait I used that joke already once" Peltonen sits on Thomas's face, and the rest of the Panthers move it around until he tips it around Thomas. Vokoun gets pulled, and everybody misses. Game. Thanks again to Whale4Ever over at the Litter Box for participating in "5 Questions with the Enemy!"